You must register your vehicle within 30 days of purchasing or 90 days of becoming a resident. You can retain your plates for a small fee but you must surrender them if you are moving out of state or cancel your insurance. All vehicles must be registered with the Department of Motor Vehicles (DMV) in Delaware. This includes cars, vans, trucks, motorcycles, trailers, and motorhomes. If you are a new resident to Delaware, you have 60 days to register your vehicle. If you are buying a new or used vehicle, you have 30 days to register your vehicle. Note: When you buy a vehicle from a dealer, they will usually handle the registration of your vehicle’s license plates. Whether you obtain the placard or the license plate, you will be permitted to park in any handicapped parking spaces. Out-of-state placards and license plates are valid in Delaware. If you become a resident, you will be obligated to register your vehicle and obtain new plates or placard. For just $40 (in addition to your standard registration fees) you can get a personalized license plate. You can look up available license plates for free online. Additional fees are required for these specialty plates. For example, the fee for an antique plate will cost you $25. Don’t get caught without a license plate, see lost or missing plates for more information. You must report your plates to the police if they were stolen. The DMV will provide you with temporary tags or plates until your new license plates are delivered. You may be able to apply for the same license plate number, however, you may want to get a new one to avoid problems if your plate was stolen. If you are the owner of a new vehicle, you are able to transfer your old license plates. In addition, you can request to retain your license plates until your have purchased a new vehicle. If you are buying a new car from a dealership or trading it in, often they will handle the transfer of your license plates for you. When you purchase a new vehicle, you can return to the DMV to register with your retained plates. If you cannot return your license plates in person, you can also mail them in to a DMV office in Delaware. In some situations, you may want to perform a background check on the vehicle you are purchasing or check are see if a license plate number is available. 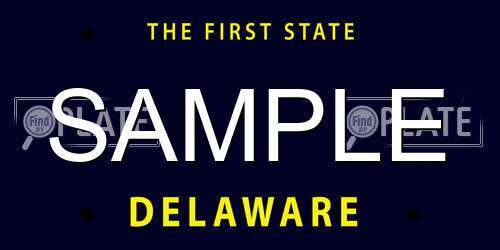 FindByPlate offers a free search engine allowing you to look up license plates in Delaware. Find out if the car you’re thinking about buying was stolen or whether “CUTECARE” is available to personalize your plate.